UNSW Eastern Suburbs have progressed through to their third Grand Final in as many years after defeating a gallant Auburn-Penrith on Saturday at Blacktown International Sportspark. The two sides met for the third time this season with the weekend’s margin of 6-points the closest the Giants have come to defeating last year’s premiers. Unfortunately for the Giants, this means the end of their finals campaign. 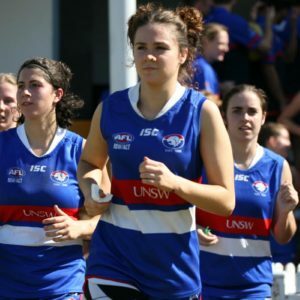 The Bulldogs on the other hand now have the opportunity to defend their title and make it a hat-trick of AFL Sydney Women’s Premier Division Premierships. 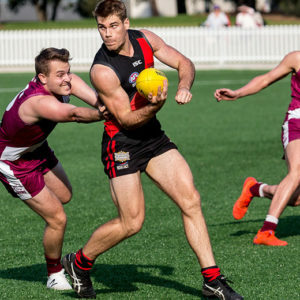 Saturday’s Preliminary final started as you would expect any Elimination Final to begin, with fierce tackling and pressure creating a number of stoppages. It wasn’t until the 10-minute mark that the first goal was scored through UNSW Eastern Suburbs’ Meagan Kiely. A quick snap on goal gave her side the only goal of the quarter and a seven-point lead at quarter time. The Giants began the second quarter with purpose. They had the first scoring opportunity through a strong mark taken by leading forward Jessica Gay. Gay’s shot on goal just fell short and was touched on the line by Bulldogs’ defender Sandra Janjetovic. Bulldogs forward Jacinda Barclay had started the game in great form and continued this into the second quarter. Barclay is quick to read the play – anticipating forward entries, leading up the ground and playing in front. Two perfectly weighted kicks in succession by the Bulldogs’ Rebecca Mount and Alison Parkin gave Barclay her first goal when she was delivered the ball lace-out 25 metres out straight in front. Barclay, who is a reliable set shot on goal, made no mistake. The Giants responded almost immediately through young gun Haneen Zreika. The midfielder pushed up into Auburn-Penrith’s forward-50 to intercept a kick across goal from Bulldogs defender Sera Kaukiono. Zreika played on, ran into goal and put it through on her preferred left. The combination of Parkin and Barclay came together for the second time in the quarter. Parkin hit up Barclay with another perfect kick inside forward-50. Barclay was quick to notice Edwina Ross had slipped into the pocket all on her own and a quick kick to Ross gave her a shot on goal from close range. Ross put the goal through and gave the Bulldogs a two-goal lead at half time. Barclay continued her good form after the half-time break, attacking the ball at every opportunity. Her side’s forward pressure was outstanding and led to the Bulldogs having the first four scoring shots for the quarter. They weren’t, however, able to capitalise, kicking points only. 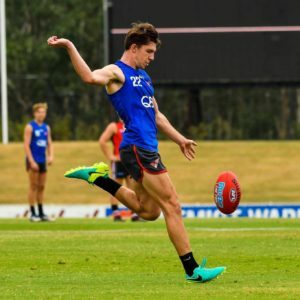 It was the Giants who were able to score the first goal of the half when they eventually broke away from the Bulldogs’ forward pressure and got the ball inside their forward-50. Their goal came from Liali Karra-Hassan who was taken high at the top of the goal square. 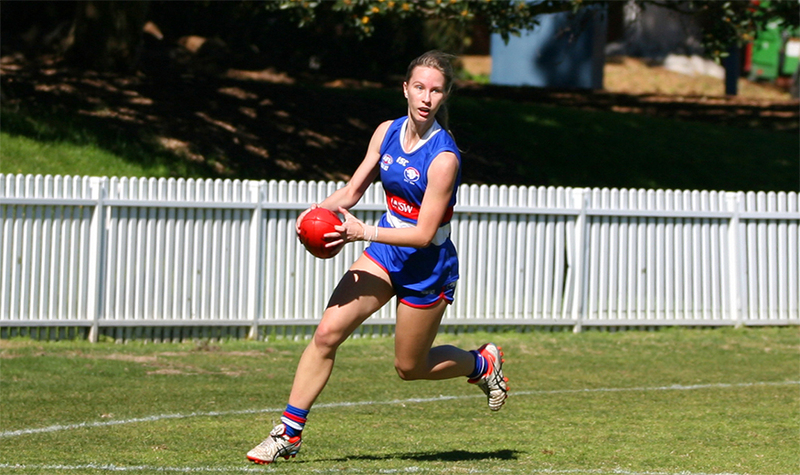 But a quick response from Bulldogs’ forward Rebecca Privitelli meant the Bulldogs went into the final term with a 14-point lead. Scoring started quickly with a long-range goal to the Giants’ Gay giving them the perfect start to the fourth quarter. The Giants had most of the momentum in the final term as they continued to push forward but unfortunately for them, they were only able to add an extra two points to their tally. 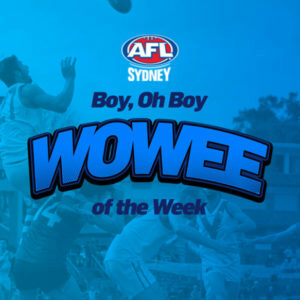 The Bulldogs defence were able to withstand the onslaught, giving their side the victory by six points.